When I was on my holiday in Cairns I had a list of attractions I really wanted to visit, some I had seen on TV and some I had read about. One such attraction was a shop, but a very different shop called “Crystal Caves”. This attraction is basically a shop that has had some imitation caves built into the basement of the building. It is situated just an hour from the Cairns on the beautiful Atherton Tablelands. The Crystal Caves is one of Australia's most spectacular private mineralogical collection with over 600 specimens such as Crystals, Gemstones and Fossils on display. But there was only one reason I wanted to visit the “Crystal Caves” and that was to see the “Biggest Amethyst Geode” in the World”. The “Empress of Uruguay” is the most amazing, breathtaking crystal or for that matter anything I have ever seen. 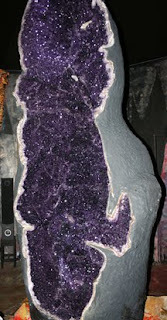 This incredibly beautiful deep purple amethyst geode stands well over 3 metres (11 feet) tall and weighs 2 ½ tonne. 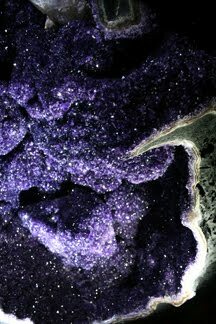 The tens of thousands perfect, deep purple amethyst crystals are mesmerizing, and whilst in the presence of this truly amazing geode it was like time stood still. I cannot really describe how I felt looking at the crystals shining but I do know after sitting looking at it for what seemed like seconds but was actually about 30 minutes I found it very difficult to leave the room. I know that my next trip back to Cairns will definitely include a return visit to the beautiful “Empress of Uruguay”. “Living to Learn”: Today I thought I would share another Australian word. “Davine Time” update: This morning I had a little sleep in. Wow, that's beautiful Davine. I can't even fathom being in the presence of something to breathtakingly beautiful!